1. This is the real thing—science fiction written by a real scientist who is also a gifted writer, following in the footsteps of Isaac Asimov, Arthur C. Clarke, Charles Sheffield, and other top-selling scientist-authors. 2. Like Travis’s Warp Speed, this new novel has a rapid-fire story action and suspense. At the same time, cutting-edge science is deftly incorporated into the story, in the tradition of Larry Niven, Robert A. Heinlein, James P. Hogan, and other masters of real science fiction. 3. Featured book on Baen.com. 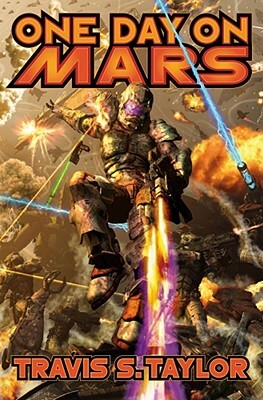 It’s 24 on Mars: a nonstop futuristic thrill-ride, all in one day, through the critical events which were the breaking point for the underclass of Martian citizens and precipitated a revolution to break the Martian colonists free from the formidable Sol System government. The formerly red planet—now in danger of again becoming red, blood red—would never be the same, nor would the human race. It was one day that changed the course of history for the Solar System, raging from hand-to-hand combat to piloted armored mecha suits clashing to an enormous space battle, with dedicated heroes on both sides of the conflict wondering if they were doing the right thing—and if they would live to see another day. And wondering, as well, if the spark of this new war, that would eventually reach across whole star systems, would bring them peace One Day on Mars. Travis S. Taylor—“Doc” Taylor to his friends—has earned his soubriquet the hard way: He has a doctorate in optical science and engineering, a master's degree in physics, a master's degree in aerospace engineering, all from the University of Alabama in Huntsville; a master's degree in astronomy, and a bachelor's degree in electrical engineering from Auburn University. Dr. Taylor has worked on various programs for the Department of Defense and NASA for the past sixteen years. He's currently working on several advanced propulsion concepts, very large space telescopes, space-based beamed energy systems, and next generation space launch concepts. In his copious spare time, Doc Travis is also a black belt martial artist, a private pilot, a SCUBA diver, has raced mountain bikes, competed in triathlons, and has been the lead singer and rhythm guitarist of several hard rock bands. He currently lives in Alabama with his wife Karen, and their daughter.